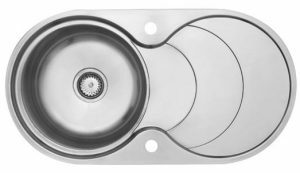 What Type of Kitchen Sink Should I Buy? 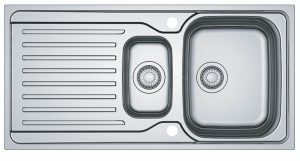 Home / Sinks / What Type of Kitchen Sink Should I Buy? Whether you’re redesigning or refreshing your kitchen, the sink is one of the most used commodities in the room and needs careful consideration before buying. Your choice will stay with you for years to come so style, shape, and type all need to be accounted for. Your needs and personal tastes will determine what kind of sink you should choose, and trust us, there are a lot of different types and style to choose from. There is no one size fits all sink, so doing a little research before you buy will ensure that your kitchen sink will not only last for many years to come, but that it looks great too. So, let’s get down to it. When choosing a sink there are a number of different styles available to you. 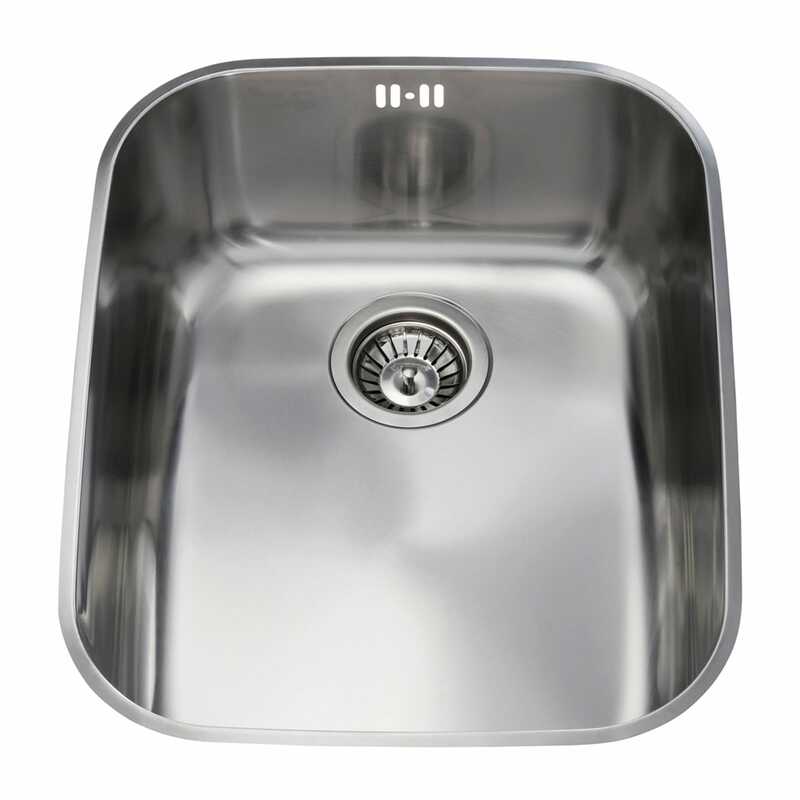 The most common types of sink that you will encounter are ceramic, glass, granite, stainless steel, and composite. Each type has its pros and cons, different price points, and suitability for your home. 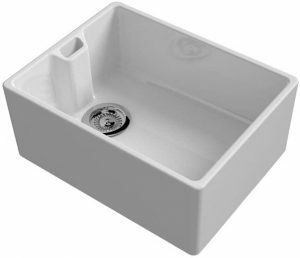 Browse our Reginox Ceramic Sinks! Ceramic sinks are not only functional, but incredibly stylish. 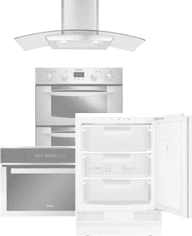 Their glossy finish and clean lines make them very popular in both modern and traditional kitchen settings. They are easy to clean, hard-wearing and although traditionally available in cream and white, can now be found in a range of colours and hues. Ceramic sinks are often made from materials such as clay, quartz and feldspar, giving them a solid and durable finish. This is why they are a little more expensive than other types of sink. They make an ideal choice for family homes as they won’t dent like a stainless steel sink might, if something heavy is dropped into it (however, this also means that any plates or glasses that might slip through soapy fingers don’t stand much chance of surviving in one piece). They can withstand hot pans and dishes being placed directly onto their surface without warping or discolouring, too. Whilst they are hardy, they can chip or crack if treated particularly badly, and a small blemish can result in a larger discolouration around the damaged area. Ceramic sinks look beautiful in country-style kitchens, especially when fitted farmhouse-style (with the front exposed). 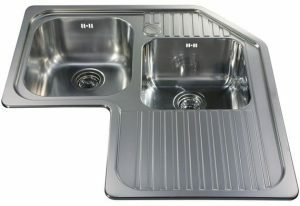 Browse our Composite Sinks, starting from £69.99! Composite sinks strike the perfect balance between hard-wearing durability and good looks. As the name suggests, composite sinks are made from a combination of two different materials; quartz and granite are popular choices though acrylic blends are also available. The combination of materials makes composite sinks incredibly heat-resistant so hot plates, pots, and pans won’t leave a mark behind. Their compact construction also makes them highly resistant to scratches and dents from wayward silverware or dropped dishes. Composite sinks are a very popular choice for many homeowners because they look the part without costing the earth. Whilst still more expensive than stainless steel sinks they are long-lasting and hard-wearing and can complement any style of kitchen. Stainless steel is one of the most popular choices for the kitchen sink. They’re classic, hard-wearing and look great in all styles of kitchen. They’re also very affordable, but don’t let that worry you: we’ve come a long way in terms of design and today’s stainless steel sinks look sleek and are tougher than ever. They won’t crack or chip, like ceramic might, but the bowl can get scratched so a little care needs to be taken when placing items in. Buy a brand-new sink from Ship It Appliances today and get fast & free delivery! Available in a range of sizes and finishes. It’s not only the type of kitchen sink that you need to decide on, there are plenty of different styles to choose from too. Each style has its own unique features, so it’s important to think about how you want your sink to function in your home, as well as how you want it to look. Let’s run through the most popular styles, so you can make an informed choice for your home.